From Friday 3rd until Monday 6th August the Berwick Arts and Crafts Festival will be running at Dewar's Lane Granary. There will be lots happening throughout the long weekend and the full timetable of workshops, demonstrations and craft stalls can be found here. I'll be running a 3 hour workshop teaching basic wire wrapping and how to use the technique with found sea glass and pebbles. 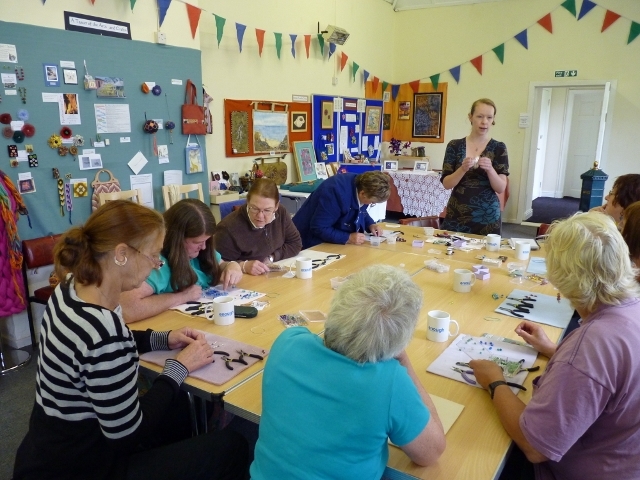 The picture shows my workshop at last year's event where I look utterly shattered and ready for a holiday! I fear I may look similar this weekend! The Festival has grown and will be in a great new venue of The Granary which recently opened after a major restoration project which brings Berwick new gallery space, youth hostel, bistro and meeting rooms. You can book workshops directly through the website or at Berwick Library tomorrow, July 30th between 10am and 4pm. Have fun. This post has given me a tiny sad, as we were supposed to be Borders bound (I have friends in Duns) that weekend, and have switched it!